This evening we rustled up some veggies, a little tomato sauce and other ingredients and dove head first into a little pizza making. We found a recipe first in the local edition of 24 Hours newspaper and modified it once we had the pizza yeast with yet another recipe. That recipe is what we chose to make in the end. After just less than hour of making the 30 minute pizza (hey the first attempt is always the longest time you ever make a recipe) we popped the pizza into the oven for a fifteen minute baking. We waited patiently while the sweet smell of pizza emanated from the oven. But finally the wait was over and we opened the oven to find our pizza ready for cutting. 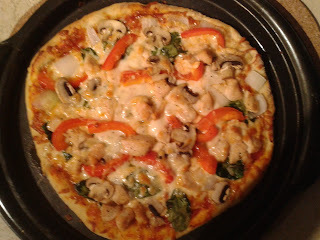 Overall this recipe tasted just like the pizza from our nearby pizza place, Abruzzo's which we enjoy somewhat. 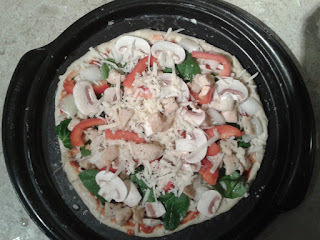 On our pizza we included mushrooms, chicken, red peppers, spinach and of course mozzarella cheese. Hopefully next weekend we will take this recipe for a whirl, because over an hour later I'm still full!